Traceability enables to track the movement of a food product through the various stages of production, processing, and distribution. It helps to identify the sources, recipients, and transporters of the food products. The purpose of tracing food products during each stage of supply chain from retail stores to farms is to find the source of contamination in the increasing incidents of adulteration and contamination of food products causing serious health threats. Growing foodborne diseases and food adulteration incidents and increasing concern for food safety among consumers & governments are contributing to an increase in the adoption of food traceability systems, globally. The global market has been segmented on the basis of technology into RFID technology, GPS, barcodes, infrared, and biometrics. The market has been segmented on the basis of end users, which includes manufacturers, warehouse, retailers, and government departments. On the basis of application, the food traceability market has been segmented into meat products, fresh food produce, dairy products, beverages, seafood products, and others such as grain, oilseed, and coffee. The market has been segmented on the basis of regions into North America, Europe, Asia-Pacific, Latin America, and Rest of the World (RoW). The key countries of regions are also studied. The food traceability market is projected to grow at a CAGR of about 9% to reach $14,304.9 billion by 2019. In 2013, the market was dominated by North America, followed by Europe. 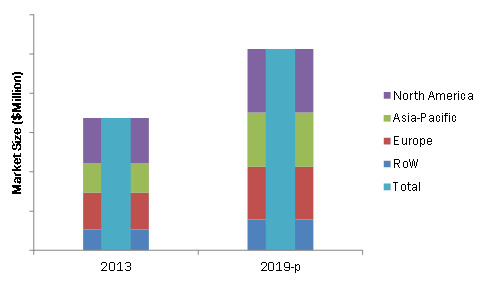 The Asia-Pacific market is projected to grow at the highest CAGR, with the rapid growth in various applications including fresh food produce, meat produces, and seafood products in developing countries such as India and China. The rising demand for technologies such as barcodes, RFIS technologies, and biometrics in this region is also driving the market. This report includes market sizes in terms of value ($million). The report provides both, qualitative and quantitative analyses of the food traceability market, the competitive landscape, and the preferred development strategies of the key players. The key players were observed to prefer new technology launches & developments, expansions, and acquisitions as strategies to garner a larger share in the market. It also analyzes the market dynamics and issues faced by the leading players. The research study categorizes the market on the basis of technologies, end users, applications, and regions. Traceability is a technology that enables tracking of a food product throughout the supply chain from raw material suppliers to end consumers. The food traceability market is increasing with the growing awareness about food safety among the consumers and government authorities. The consumers are demanding complete information and transparency regarding the food products. Governments are implementing stringent regulations to track food as it is directly impacting consumer health. The main restraints in this market are the additional cost involved in the traceability equipment. The market has been growing significantly over the last five years due to its increasing use in various applications in the food & beverage industry. The global market is segmented on the basis of application, which includes meat products, fresh food produce, dairy products, beverages, seafood products, and others such as grains, oilseed, and coffee. The fresh food produces dominated the food traceability market in 2013. This market is projected to grow at a CAGR of about 9% from 2014 to reach 14 billion by 2019, with advancements in technology and rising opportunities in emerging markets such as India, China, and Brazil. In 2013, the North American market was the largest for food traceability. 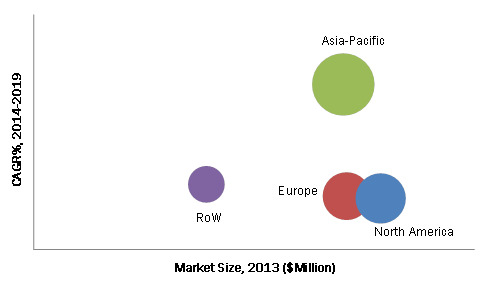 The market in Asia-Pacific is projected to grow at the highest CAGR during the review period. The market is fragmented and competitive, with a large number of market players operating at regional levels. The key players in the market adopted new technology launches and developments as their preferred strategy. The key players such as Honeywell International Inc. (U.S.), C.H. Robinson Worldwide, Inc. (U.S.), Bio-Rad Laboratories, Inc. (U.S.), DuPont (U.S.), Cognex Corporation (U.S.), and SGS S.A. (Switzerland) have been profiled in the report. 12.7 Bar Code Integrators, Inc.